KLA Healthcare Consultants is excited about our new website designed by the extraordinary RocketFuel. The Rocket Fuel team is what they promise: Intergalactic Web Experts In Our Neighborhood. With our newly designed site we will be able to quickly post new resources and blog entries for the use of our clients and friends. With the easy to use web interface, we can make these changes ourselves, from our desktops, as needed. 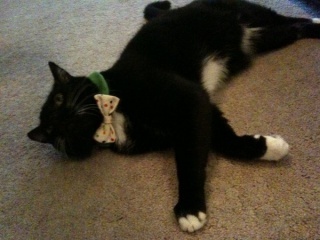 The Rocket Fuel animal lovers always include a picture of Bowtie the cat when launching a new website. The employees of KLA share a love of animals. Our combined pets include cats, dogs, birds and fish. We even have a nest of baby finches on a lightpost outside our office. Thank you Rocket Fuel. We appreciate you. In homage, we'll keep Knox in his bowtie for luck. We'll drink our champagne instead of breaking it over the bow of our new website.